Keenan, a privately held insurance brokerage and consulting firm based in Torrance, Calif., launched a website that offers information on Health Care Reform (HCR) and its impact on school districts, public agencies and health care organizations. The site is designed to assist those public sector employers in staying on top of rapidly approaching changes, program details and best practices resulting from the coming shift in the U.S. health insurance system. The site is geared towards California public agencies, but it contains information that public agencies nationwide may find useful. "We fully appreciate the fact that the Affordable Care Act (ACA) presents significant challenges to employers in terms of both understanding and implementing this complex change that is approaching very quickly," said Charlotte Doepker, Keenan assistant vice president for digital marketing. "Our goal is for the new Keenan Health Care Reform website to be the go-to reference for staying ahead of the curve as this transformation takes effect." Administration. Important plan administration considerations under 13 topics from grandfathered and exempt plans to non-discrimination, reporting and rescession guidelines. California Exchange. Specifics on the Covered California health benefit exchange and what you need to know about the Exchange as an employer. Upcoming Requirements. Includes a list of the important HCR requirements that all organizations must implement, including the compliance date and instructions on how to comply. Cost Drivers. Descriptions of some of the major cost considerations related to HCR such as avoidable costs for employers and employees, as well as potential sources of savings. Tools. Includes a timetable, action item checklist, videos, glossary and penalty flowchart. Briefings. 29 Keenan briefings that aim to simplify the legal language within regulations of the ACA and specifying how they pertain to employers. HCR Insights. Has news items and original articles to help keep employers up to date on the latest developments in Health Care Reform. What Keenan Can Do for You. A description of Keenan’s tools and services to help employers find solutions to their HCR concerns. 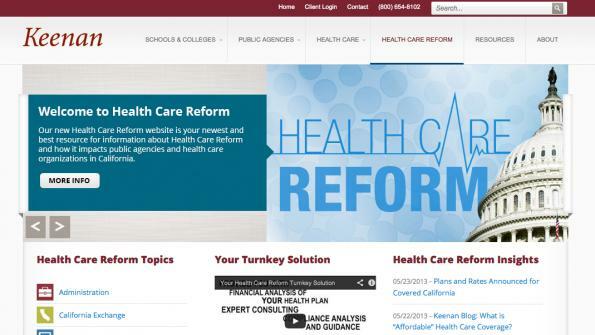 The Keenan Health Care Reform website can be found here. Founded in 1972, Keenan is ranked as the 18th largest insurance consulting and brokerage firm in the U.S., and the largest independent broker in California. Keenan provides insurance products and services to schools, community colleges, healthcare organizations and municipalities for employee benefits, health benefit management services, workers' compensation, risk management, and property and liability.